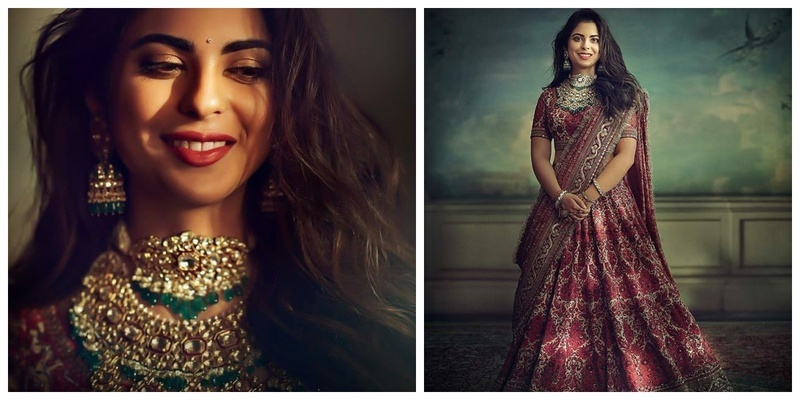 Isha Ambani in a painted lehenga with open wavy hair was a sight to behold at her recent Graha Pravesh pooja! As you know the Ambani’s kicked off Isha Ambani and Anand Piramal’s wedding festivities with a Dandiya Raas hosted by Kokilaben Ambani and it was epic. Well, that was just the beginning of many more ceremonies to follow later. Just last night Isha Ambani was spotted in a a custom hand-painted, hand-embroidered tilla-work lehenga and antique bandhej dupatta for her graha-pravesh pooja and exuded some major regal vibes. The outfit was also a part of the India Revival Project by Sabyasachi. She completed her look with a necklace and earring set featuring uncut Syndicate diamonds and Zambian emeralds and looked every bit phenomenal. She kept the makeup minimal with a small bindi and open wavy hair. Daddy dearest - Mukesh Ambani was spotted at Tirupati Tirumala temple in Andhra Pradesh this morning to place Isha Ambani's wedding card before Lord Balaji. This is the picture of him with his youngest son Anant Ambani, leaving the Balaji or Venkateswara Swamy Temple, popularly known as the Tirupati Temple. The Reliance Industries chairman was seen in a red silk stole.